The black-and-white ruffed lemur lives in the eastern rainforests of Madagascar including the island of Nosy Mangabe. Like the closely related red ruffed lemur of the Masoala peninsula, black-and-white ruffed lemurs are highly territorial and practice communal care for infants which are kept in nests rather than being carried on the backs or stomachs of their mothers. The mating season for black-and-white ruffed lemurs runs from May and July, during the dry season. Babies are born at the onset of the rainy season when food is most plentiful in September or October. Typically, black-and-white ruffed lemurs construct a nest out of small branches, leaves and moss at a height of 33-66ft (10-20m). The parents take turn watching the young which may number 1-5. Despite the parental care, only about one-third of the young survive infancy -- falls are quite common. 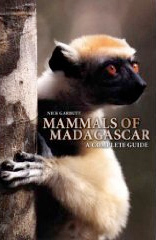 Sexual maturity is reached at 2 years and this lemur may reach an age of 20-25 years. 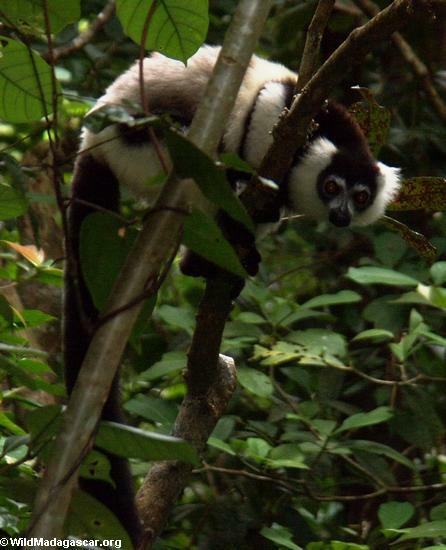 Black-and-white ruffed lemurs are widely hunted over their range and only exist in low population densities. They also suffer from habitat loss.